In the wake of a truce between the Nice Side and the Mice Side, the Zooverse has settled into a beautiful era of peace. However, the villainous mouse, Boo Boo Squeal, is determined to violate that peace treaty, and restart war at any cost. Assembling a team of the galaxys most despicable deplorables, Boo Boo targets the Nice Side heroes, Nuke Tiptoes and B-52, and attempts to eliminate them before regaining the most awesome prize in all the Zooverse: the power of the Sauce. With the Nice Side leader, Princess Sparklefeather, away on honeymoon, Nuke and B-52 are forced to fend for themselves, thwarting Boo Boos vengeful minions and defending the Zooverse with everything theyve got. With time running out, and Boo Boo getting closer and closer to acquiring Sauce power, Nuke and B-52 enlist some friends of their own, in an effort to derail the Mice Sides sinister plans and keep the Sauce from falling into their evil clutches. Who will emerge victorious - the Nice Side or the Mice Side? Will Boo Boo Squeal finally achieve full Sauce power? Will Nuke Tiptoes save the Zooverse again? Will B-52 ever find the right robot lubricant? 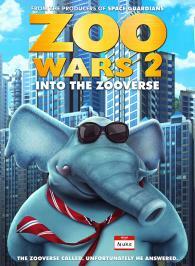 Find out the answers to these questions, and many more in...Zoo Wars 2!